What destroyed the Maya? We have a new clue, in the form of an ancient stalagmite. The Maya civilization was among the most advanced in history, and its disintegration has perplexed researchers for ages. One of the most compelling theories to date suggests that a shifting climate, playing puppeteer to sociopolitical marionettes, had a devastating role in the Maya's downfall. Now, researchers have combined remarkably detailed climate data — recorded in a Central American stalagmite — with historical records to help determine what really happened to this mysterious Mesoamerican society. In a paper published in today's issue of Science, a team led by environmental anthropologist Douglas Kennett presents its case for a two-stage, climate-mediated Maya collapse. Supporting this claim is one of the most detailed climate records ever constructed for the so-called "Classic Period" of Maya history (an interval between 250 and 900 CE during which the civilization peaked and subsequently crumbled), a record that suggests a varying climate may have been at times a blessing as well as a curse. The team's search for answers began six years ago in Yok Balum, a recently discovered cave in the dense forests of the Belizean jungle. The cave is positively crawling with cave formations known as speleothems, dramatic-looking mineral deposits that can take thousands of years to form, inching their way into existence as rain water rich in calcite, aragonite, and gypsum leaks and drips its way through a cave system. Among the most stunning speleothems are stalagmites, tooth-like projections that rise upward from the cave floor. Contained within each is a detailed history of the surrounding region's rainfall — but some stalagmites keep more exhaustive records than others. Not all speleothems grow continuously, explained Kennett in an interview with io9, a fact that can lead to undesirable gaps in the climate record. Still others contain isotopic elements that can make them difficult to analyze. But in 2006, Kennett's team recovered a 56-centimeter-long stalagmite, located 50 meters from the entrance of Yok Balum, that had been very meticulous with its bookkeeping. They named the formation YOK-I. What's special about this record is that it covers 2000 years, including a critical period of Maya development and collapse [spanning CE 250—900]. We have a continuous record, and it's very high resolution [six-month increments! ]; there are no records for this area that even come close to this resolution. That means we have much more data, and more accurately dated data, to work with than ever before. There's a lot to unpack in this figure, so let's stick to the highlights, and break it down piece-by-piece. One of the things that's surprising about this figure, Kennett explains, isn't related to drought but to wetness. Take a look at the period between CE 440 and 660. You can see that during this time span precipitation was actually fairly high. "Relative to the rest of the record, that's a pretty unique period" Kennett notes — one that kicks off an explosion in culturally and socially complex Maya societies, as evidenced by the proliferation of urban centers, dated monuments and the like. "Rainfall feeding the Maya's wetland farming systems worked really well, until they were faced with a climatic downturn," says Kennett, which his team argues started happening around CE 660. "That's where you see a trend toward drying," he explains, "and it's during that interval when you start getting these peaks in warfare, but you also get proliferation of competing centers." With downturns in climate come political unrest. Kings lose power and control under these conditions. Wars are waged. Polities fragment and cities disintegrate; what's more, they seem to do so almost all at once starting in the late seventh century, where the number of monuments being erected drops precipitously, only to peter out entirely around CE 900 — the timepoint most commonly cited as the "end" of Maya civilization. "There's some complex things that are happening in the later period that we argue drought and longer-term changes had an effect on. Drought certainly isn't the sole thing," he points out, "but it's part of the overall system." Kennett's team argues that it was this drought that really spelled the end for the Maya, the second blow in a devastating 1-2 punch that led to the total dissolution of one of history's greatest civilizations. "The first stage of the drought is related to general drying — some key droughts between CE 660—900 that promote overal social instability that manifests itself through interpolity warfare," explains Kennett. "But there's new data, and this needs to be tested, suggesting that in some areas you find populations that persist up to around CE 1100." 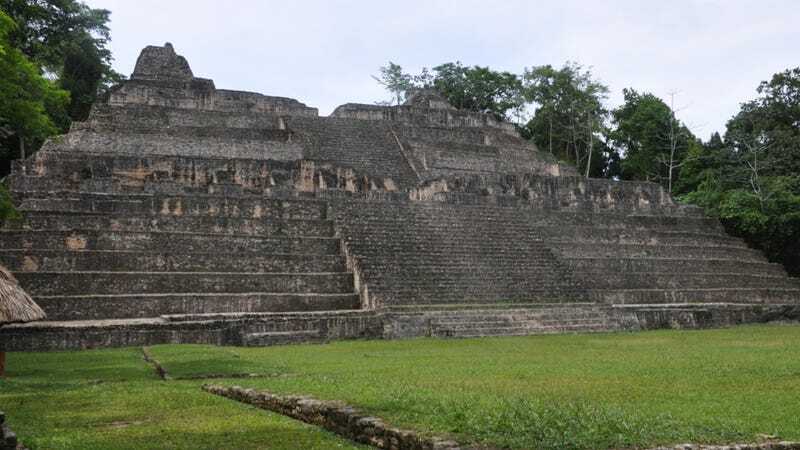 After all, he notes, Maya political structures may have crumbled, and cities may have been largely abandoned, but people didn't necessarily leave, and they certainly didn't disappear entirely. There was an enormous drought in 1535, and you can actually see it in the climate record we produced from YOK-I [circled in red below]. We know from historical data that this drought had a major impact on agricultural systems. It reduced productivity, led to famine, population relocation and death. I mean, a million deaths in Mexico alone were recorded at the time. And those are just the ones we know of — the records aren't even that great. What's staggering it that when you compare the drought of 1535 with those that would have affected the Maya, the earlier dry spells are actually longer, and happened more abruptly. "Those are big events," explains Kennett, "and long-standing. You can imagine what the population effects would have been like for small-scale farmers." Kennett says if there's anything for people today to take away from his team's research, it's the relevancy it holds to contemporary issues. Obviously people are worried about global climate change, he explains, but often there's undue emphasis placed on abrupt changes — a sudden drought, perhaps, or a record-setting hurricane. "What we try to highlight in our paper," he explains, "is how climatic events can unfold on very long time scales," and that the way society responds to those changes can be crucial. "The connections between climate and war and societal instability are ones that we think are important," he notes, "ones that we should be concerned about in light of our current situation." Kennett's team's findings are published in the latest issue of Science.